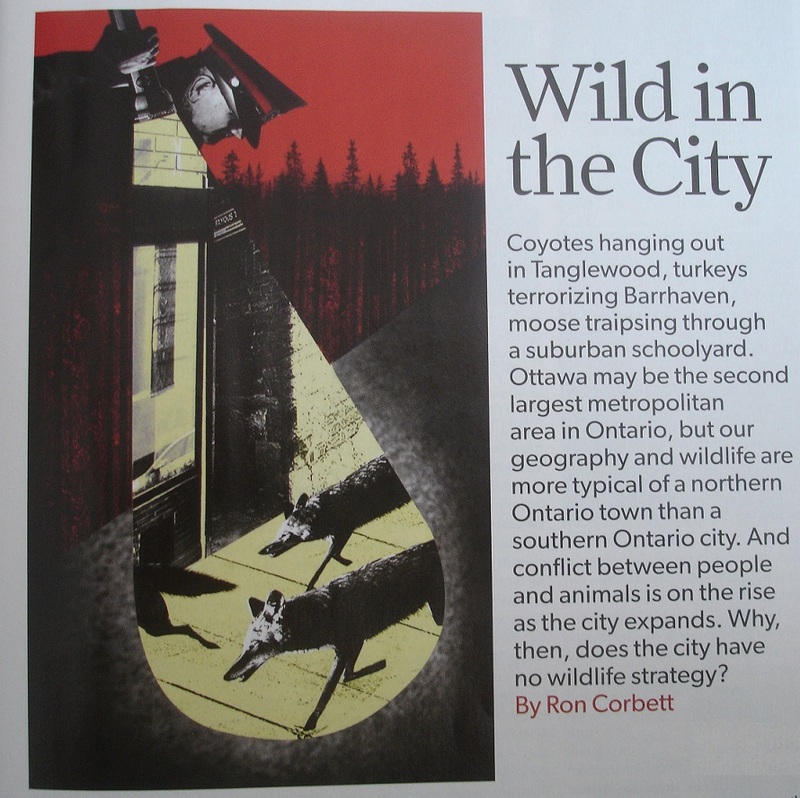 I was very surprised by the heavy-handed, one-sided Ottawa Magazine's "Wild in the City" article published in April (2013), although I should have noted before I started reading that it was placed in the "Political" section. Ron Corbett angled the article as do many journalists in present-day media seeing wildlife as a nuisance and describing the negative and/or confused attitudes of locals and by describing ways of "getting rid of the problem". In his article he describes menacing coyotes including one that hung out in a Kanata backyard for days, clueless Glebites trying to save trees by poorly identifying migratory birds, crows roosting in Alta Vista "that would scare Alfred Hitchcock" and beavers frustrating City of Ottawa staff by daming up storm water pipes, etc. He interviews many people including councillors and Ministry of Natural Resources employees but sadly there is only one short paragraph detailing humane options for coexistance that MANY cities are employing and/or considering: naturalizing perimeters with tall grass and addling eggs to discourage the over population of geese (in cities like Kelowna and Peachland, B.C. ), installing water flow devices and "beaver deceivers" that allow beavers and people to coexist (installed in Cornwall and Mission City B.C.) and humane education solutions for urban coyote conflicts such as the "Co-exist with Coyotes" program promoted by Stanley Park Ecology Society to name a few. This could have been a great opportunity to educate local Ottawa residents on all the options we have in terms of humane solutions to live with and be able to appreciate the wildlife that flourishes and can be enjoyed throughout the city. It has taken over ten years for Ottawa to regain what was lost when the Ottawa Carleton Wildlife Centre had to close its doors to rehabilitating injured wildlife. (Kudos to the Centre for continuing in the Education realm however!) This is not the time to promote antiquated attitudes and outdated methods. This is the time to reinforce new ideas and humane options in terms of coexistance and better understanding of wildlife and their ways. I would ask that the Ottawa Magazine explore these alternatives and provide a non-biased article or better yet an article helping to educate Ottawa citizens and demonstrate better alternatives that other Canadian cities are choosing and the opportunities that we could enjoy here. 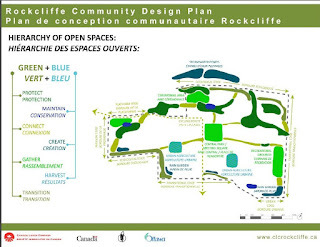 Rockcliffe Lands (future name to be determined) is a very unique urban property situated along some major green corridors and hopefully CLC and the developers can see this opportunity and will want to take advantage of it. At one point during the mid-2000's redevelopment, the thought was to make this the MOST sustainable development in the country. Fast forward to 2013, many developments are LEED Gold or Platinum - sustainability is much more reachable and not such a NEW story. So how about biodiversity? How about the first Canadian neighborhood that is not only sustainable but that is also truly biophilic. Why not consider how to design this neighborhood to not only blend into its surroundings and benefit from its environment but to also PROVIDE for the flora and fauna and let it flourish beside it? This could truly be an amazing opportunity to determine the best innovative, forward-thinking ways of redeveloping a site that would have MINIMAL impact on the native flora and fauna and perhaps even help it to become more resilient. Think about it! This could be great! 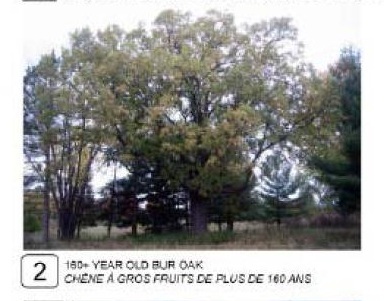 It was wonderful that the old growth (160 + years) Bur Oak was highlighted in their initial public consultations. This is a great opportunity, not only to protect this piece of history but to also benefit from its genetic legacy. Efforts needs to be made to protect and save this tree and other Bur Oaks found on the property - this includes care during construction (protecting each tree to the drip line) and proper grounds keeping and maintenance after. Some seedlings from this specimen could also be planted to continue the genetic line. At one point during the initial discussions (in the mid 2000's) there was even consideration of a tree nursery. A local native tree nursery would ensure that local hardy trees (for Ottawa's climate) would be planted on the site. This also begs the question are there any other heritage trees that could be protected on the site that are 50 plus years or over? As mentioned in the previous post Landmark Trees of Ontario commented on their Facebook page that there are multiple large Bitternut Hickories, Sugar Maples, Basswood, Rock Elm and Slippery Elm spread throughout the site. It would be great if as many of these trees could be protected as possible along with the Bur Oaks. 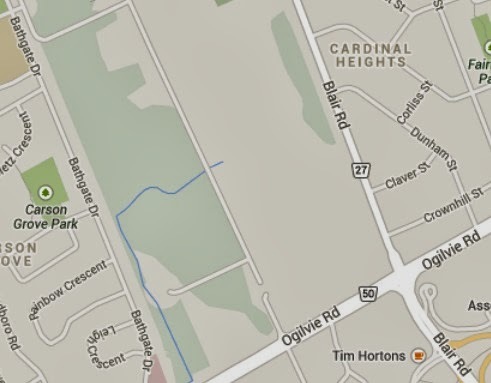 And perhaps this could be a new site to plant some direct descendants of the Ottawa Champlain Oaks? 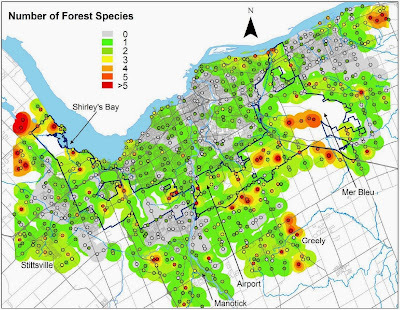 Some assessment of the composition of trees in groupings (as noted) that will be saved should be done to consider the issue of the emerald ash borer and how lost trees will be replaced. The City/N.C.C. should assess the health of Montfort Woods and the other NE corner woods that backs onto N.C.C. lands and determine how to strengthen the health of these wood lots. The health of trees would also benefit from being linked through green corridors to other wood lots. These would act as buffers so that genetic diversity could be encouraged. The tree groupings that have already been noted on the initial ClC maps could help with linking these two forests. You can see that CLC has sketched essentially this in their display below. Just imagine a line of street trees (local and native) linking all the green sites! A native tree nursery (that is commenced in 2014) would again help provide a source of local trees for this site. What a benefit and great local feature to have a green link from the Montfort woods to the proposed central park and then to the N.C.C. forest (which is part of the Rockcliffe Parkway)! One thing that this proposal is missing is the consideration of the larger landscape. In all ecological restoration projects you have to consider what is around the site since over the long term this will influence your restoration. Perhaps it was done but not shared at the public consultation meetings? What is the species composition of the forests found outside the development area? This development needs to consider the Montfort Woods and the old quarry in Fairhaven Way as it is a heavily treed neighborhood. What about the NRC government campus to the east? 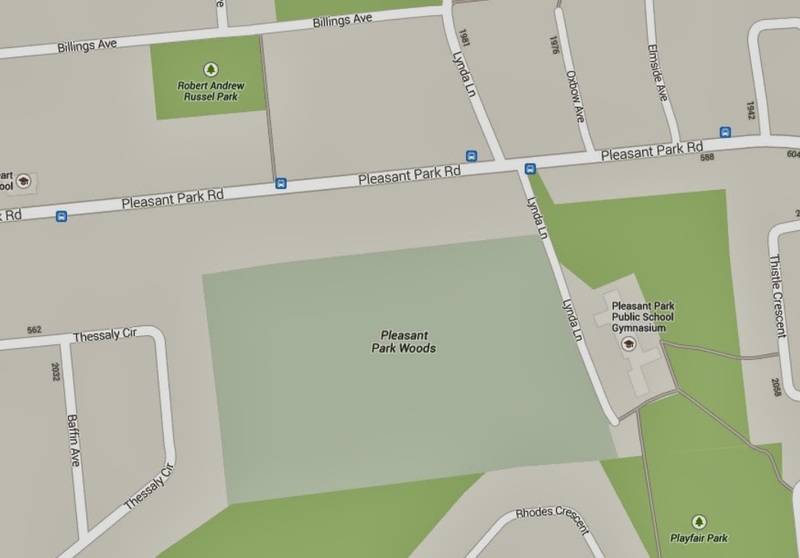 Will there be some forested area there to buffer between the two, such as there is right now for Rothwell Heights? CLC could enter into discussions with them to partner to create some buffer, add some natives, help with the genetic diversity. The NE corner woods link to some open lands along the parkway where there are bird houses and have been bobolink sightings. And the NW corner along the Aviation Parkway where it meets the Rockcliffe parkway is an urban biodiverse hot spot (according to OBBC) for birds. 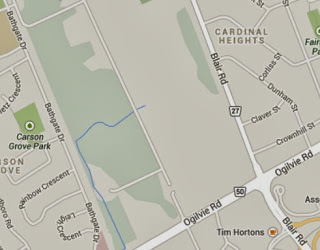 This area is a very green corridor (deer have been found in Manor Park this winter) and it includes Manor Park creek and marsh which links to Macoun Marsh in the Beechwood Cemetery. All of this needs to be considered as redevelopment occurs. Also if the storm water ponds offsite to the north of the development are built this will increase movement of fauna both to and away from the water feature and safe wildlife passages along both parkways should be considered for this area. It would be great to see the N.C.C. up their game here along the Aviation Parkway and consider how the parkway acts as a divide between the green space on both sides and determine ways to help encourage genetic diversity on both sides and strengthen the integrity of this lovely green corridor. If you still want to send your thoughts and comments to Canada Lands Company it is not too late. 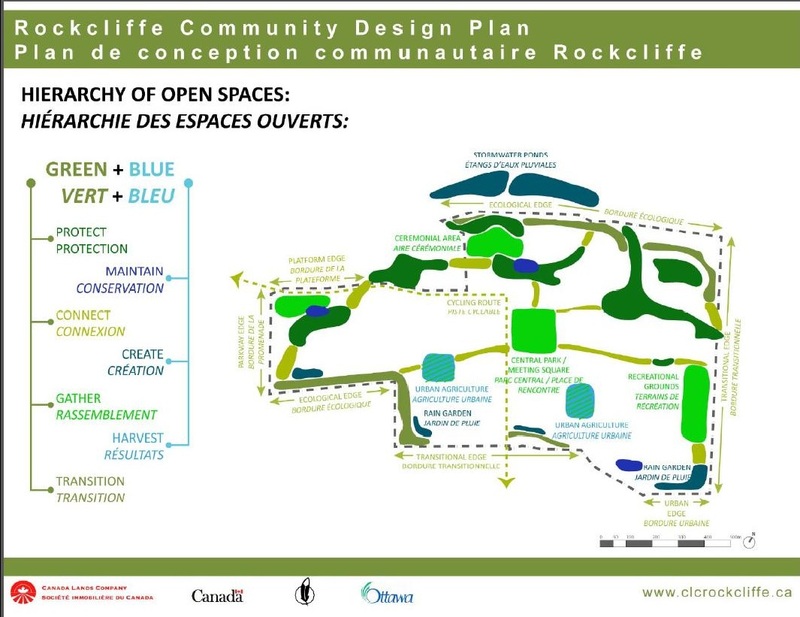 You can find their contact information on the Canada Lands Corporation Rockcliffe Lands website (syau@clc.ca,info@clc.ca). I did not find an email address for the Ottawa office however. What is a healthy forest? Can there be such a thing as a healthy forest within an urbanized area? What would a forest need to support certain "forest species"? Certain species seek out "interior forest" - a denser part of a wooded area that is buffered by other trees which support the interior core. This core is more stable and healthy as it is not affected as much by edge species (both faunal and floral) and thus can provide the type of habitat that "interior species" are looking for. Landscapes ecologist speculate that an ecological buffer such as this needs to be at least 100 metres. In reading the Ontario Nature fact sheet on fragmentation, they state that using this 100 metres as a guideline that a circular forest needs to be at least 8 hectares to have one hectare of interior forest. And in some other articles I have read, the minimum stated for a healthy forest (that has some dense interior "forest" that would attract forest species of birds) would be 10 hectares*. But most articles and studies state that this is a very difficult measure to determine and many feel that 10 hectares is too small to provide any such habitat for birds or other interior forest species. This Forest Fragmentation Study lists certain birds that are more affected by the size and some that are less sensitive to the size: "Area sensitive birds identified in this study included the Ovenbird, Acadian Flycatcher, Kentucky Warbler, and Red-Shouldered Hawk. The least area sensitive species were mostly species that were not truly interior birds such as the Carolina Wren and Great Crested Flycatcher." So does Ottawa have any wood lots of approximately that size (remembering that this is a MINIMUM size)? And what types of birds can be found in these area and around the city in general? "PCL has already started to work on site preparation by removing trees to make way for the construction of the new facility. Many of the trees found on this lot are of the ash species and have been confirmed to be infested by the emerald ash borer, a major threat to Canada's environment and forest resources. As the movement of infested tree material is highly regulated, PCL will take all precautionary measures to dispose of the trees as per Canadian Food Inspection Agency regulations . 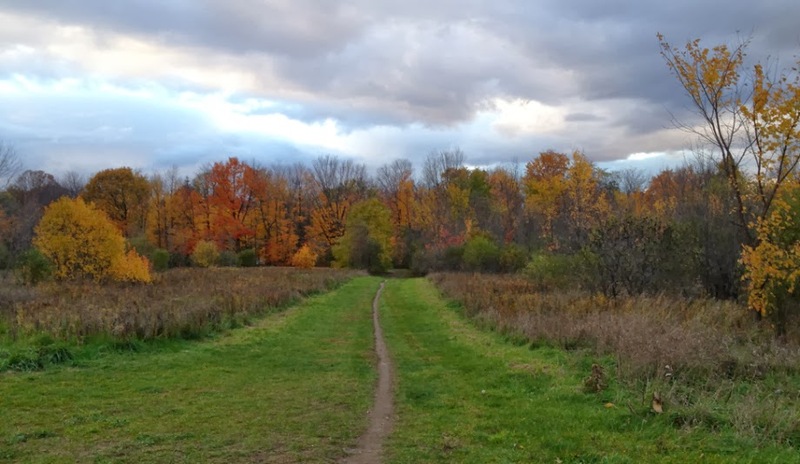 It should be noted that 90 percent of the maple grove located in the northeast corner of the site will be preserved, as well as 55 to 60 percent of the existing woodlot. Once construction is completed, there is a reforestation plan in place that will include planting more than 1000 new trees, primarily near the western edge of the site, along Bathgate Drive. Final landscaping should be expected to be complete by November 2014. The new facility will include walkways in the reforested area along Bathgate Drive extending up to the National Research Council (NRC) campus and the extension of the existing sidewalk along the east side of Bathgate Drive." This summer get out and enjoy these gems that provide habitat for some endangered and rare species (especially in urban areas!). P.S. Should we be planting more native trees as per Diana Beresford-Kroeger? The turtle crossing uses an elliptical culvert. Anti-glare mesh/screen is used as a turtle barrier/fence to restrict turtle movement onto the roadway. An artificial turtle nesting habitat made of fine crushed stone, sand, and gravel. In fall 2009, turtle protection measures were installed north of the Village of Caledon, as part of the Highway 10 widening project. To mitigate turtle mortality and promote environmental sustainability through the protection and conservation of wildlife, MTO, in consultation with the Ministry of Natural Resources, designed and implemented an under-road wildlife crossing, a barrier system, and artificial nesting habitat. Turtle Crossing: Similar to a pipe culvert design for fish crossings (below), the turtle crossing uses an elliptical culvert. The top ends of the culvert have been cut to maximize the amount of light in the culvert, helping to attract wildlife through the culvert. 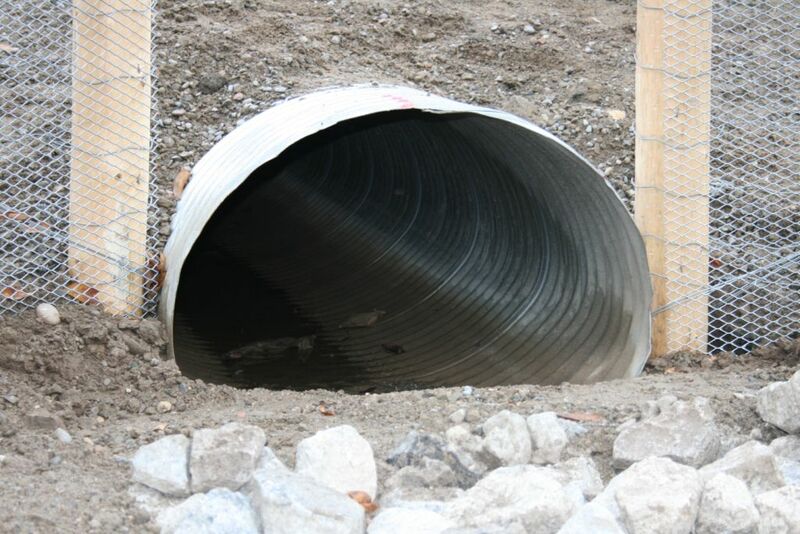 A mesh screen is attached around the area of the culvert opening to prevent turtles from climbing onto the roadway. Turtle Barrier/Fence: Studies have shown that turtles can climb fences. Anti-glare mesh/screen is used as a turtle barrier/fence to restrict turtle movement onto the roadway. The turtle fence is affixed directly onto the highway fence, and funnels/directs the turtles to the culvert installed underneath the highway. 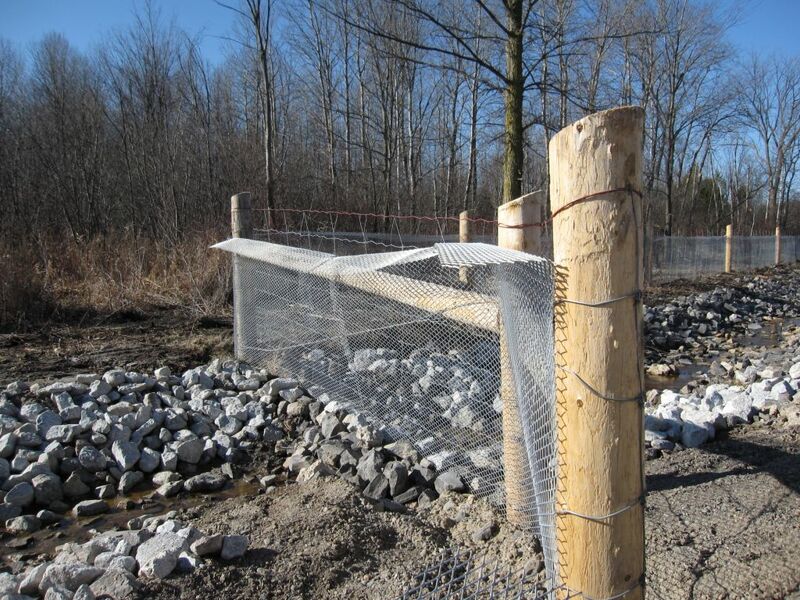 At the North Credit River Bridge, a total of 1028 m of turtle fence was installed. Though the fence is 1 m high, it features a 200 mm 90 degree bend on top that will prevent turtles from climbing and accessing the right-of-way. 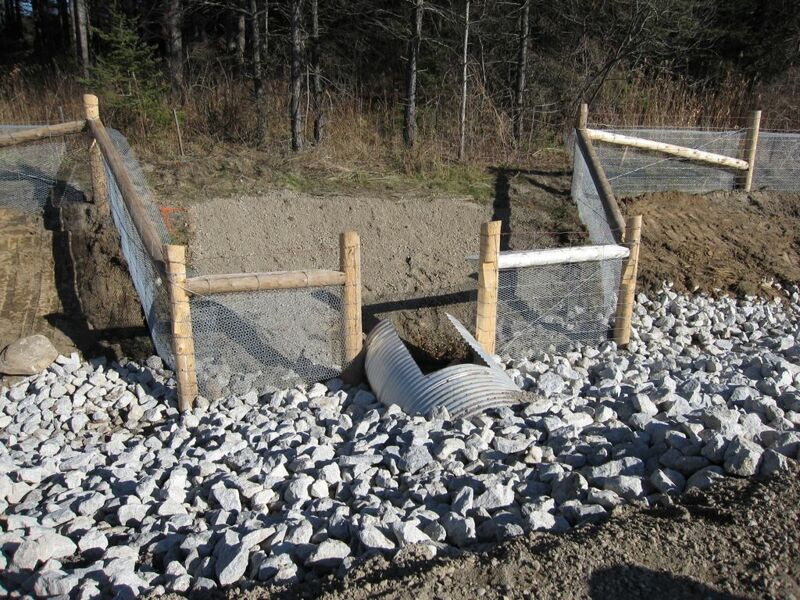 Turtle Nesting Habitat: In addition to mitigating the loss of turtles on the highway, MTO and MNR have developed an artificial turtle nesting habitat made of fine crushed stone, sand, and gravel. The habitat was constructed at the ends of the turtle crossing to provide an area for turtle egg laying. This habitat attracts turtles to the crossing due to it's exposure to the sun. To evaluate the turtle crossing system, a monitoring program will begin in the spring of 2011. Monitoring will continue for the next two years.